“Once upon a time there were four little rabbits and their names were Flopsy, Mopsy, Cotton-tail and Peter..." Peter Rabbit has plans to arrive at the FOR Community Center to start the race for the Easter eggs at 11:00 am on Sat Apr 20th. Two thousand filled eggs will be collected within minutes of the start signal. Don't be late - eggs go fast! After the hunt, stay long enough so your child can have his or her picture taken with Peter. 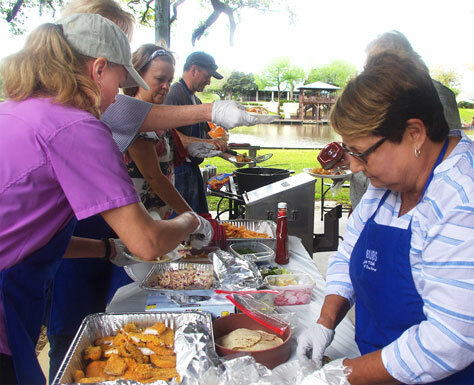 Event is free and is hosted by Friends of the River San Bernard. 6 -12 years old - kids only, no adults please! It's the annual "Migration Celebration"
Migration Celebration began as a birding festival, but has grown over time into a family nature festival; with events and presentations designed for more introductory level participation. Don’t miss it and plus it’s free!!! H-GAC Texas Stream Team volunteers Valroy Maudlin and Tim Logan, using a test kit, measure the physical and chemical parameters of San Bernard River at two locations. Valroy tests off his pier at CR 496, 1.6 miles upstream from the Churchill Bridge. Tim tests off his dock at Rio Vista, 4.5 miles downstream from the Churchill Bridge. Both tests are done on the same day at the same time each month. The test reports the pH level, salinity, temperature, dissolved oxygen and turbidity of the water. Two forms are shown for comparison as the data collected from the two locations can vary. Please note, the bacterium enteroccocus test has been cancelled after two years of testing. Want to jet ski, or boat in TX? It’s the law (Water Safety Act) that a person who is born on or after September 1, 1993 may NOT operate a boat on public waterways of Texas without supervision unless he or she has passed a Texas Boater Education Course and is greater than 13 yrs of age. This includes the following vessels - a powerboat powered by a motor of more than 15 horsepower, a personal watercraft or a windblown vessel over 14 feet in length. 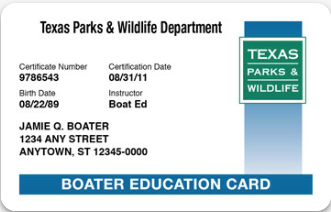 Class fee is an online payment for $35 and includes the Texas Safe Boating card cost to Texas Parks & Wildlife for those passing the USCG Aux test at the end of class. Lunch is included. >>> Use this link for PRE-REGISTRATION required for private FOR San Bernard class on Sat May 11th. Please go to the site and complete both the registration link as well as the pay online link. Lunch is included with your $35 payment. 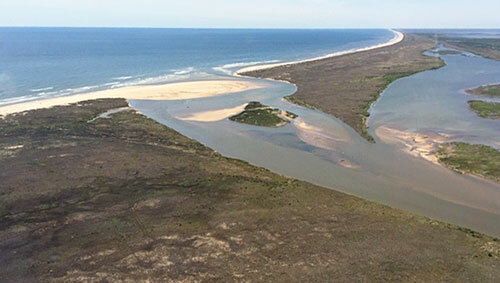 View of the mouth looking SW toward the Gulf. 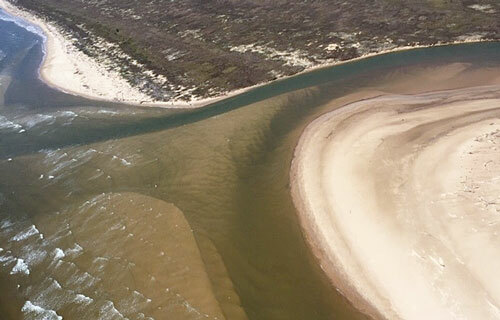 Overhead view of the sand clogged mouth with a narrow shallow opening to the Gulf. 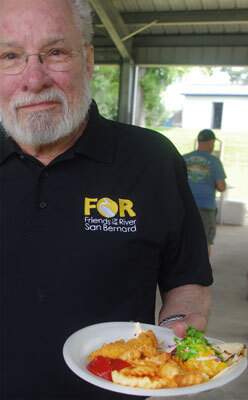 Fisherman-chef Ronnie Wingo shows off his FISH CAKES served at the program. 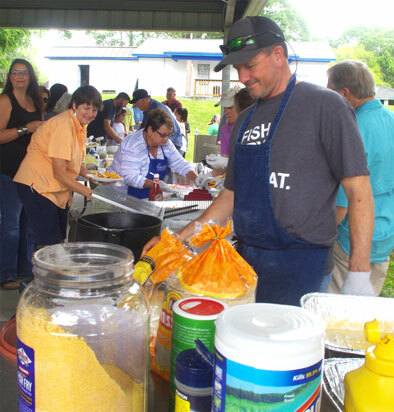 Fisherman-chef Tom Guffey dishes up his fried fish (recipe to come) during the Saturday program. Tom was ably assisted by Kelly Guffey. Ingredients lined up for frying fish. 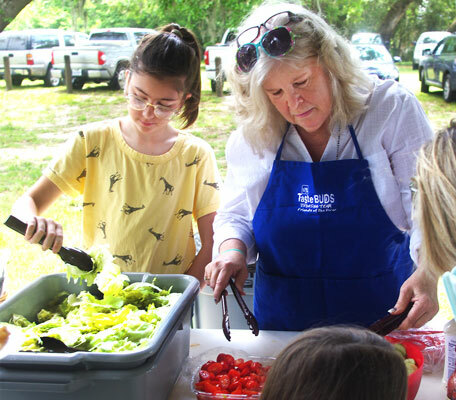 Tossing the salad is Kenlee Head and Vicky Wardlaw. 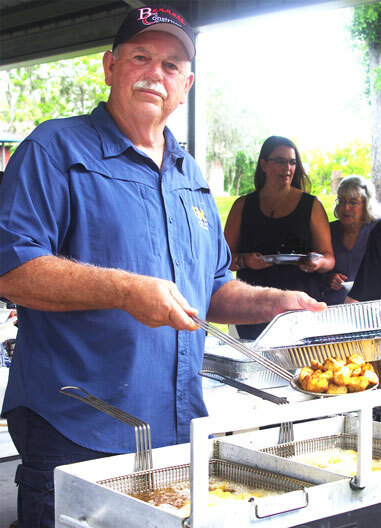 Left photo: Three heads seen at the program were Wayne and Vicki Head, Program Chairmen and waiting with tongs in hand to fry fish cakes is Ken Head, Assistant Cook to Ronnie Wingo. Right photo: FOR Director George Harris carries his plate of fish, that he didn't catch, to the table to be eaten. 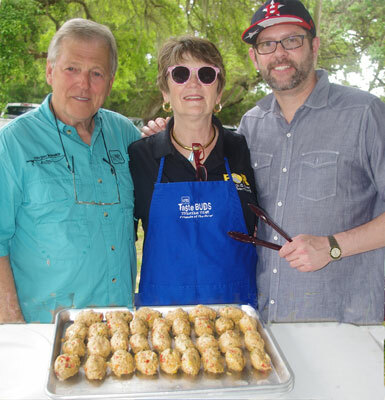 Fishermen-chefs Ronnie Wingo and Tom Guffey put their talents to the test on Sat Mar 30 when 75 folks attended the fun and delicious “Guffey-Wingo Catch’em & Cook’em Class” at the FOR pavilion. The group of attendees lined up at the start of the program and had a full plate of deliciously cooked fish, plus extras, served to them by FOR helpers. After everyone had eaten the plentiful fish dishes, Wingo and Guffey accepted questions from the audience on how-to catch’em, cook’em. A question was asked about using a popping cork - answer, the noise attracts redfish out of the marsh and the cork keeps lure off of bottom shell. Another question asked whether a high tide or low tide is better for fishing - answer, either, as long as there is current moving. 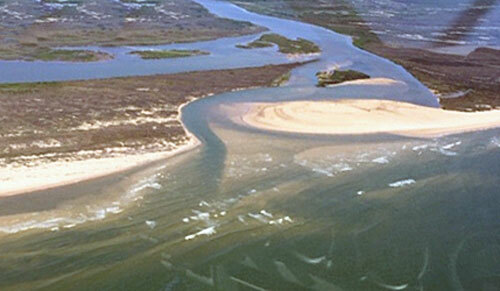 A question was asked about fishing methods on the ICW - answer, look for shell banks along the shoreline and reefs at inlets to marsh lakes. 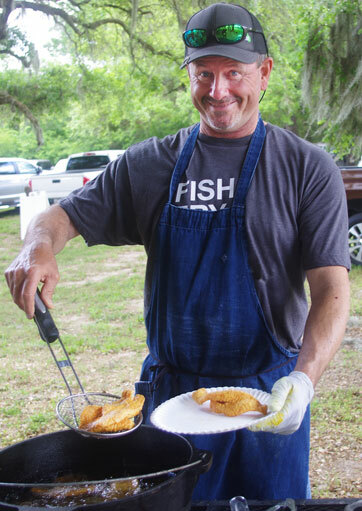 Another question regarding cooking was asked about a using method other than frying - answer, a technique for blackened redfish was explained. NOAA Hydrological Prediction Service Note - the "San Bernard River Near Sweeny" gauge is no longer maintained by Phillips 66 terminal on the river. To receive our emails and FOR newsletters, please register (upper left of this page) as we need your email address and your mailing address.